Gujarat's "total debts" reach to Rs 1.85 lakh crore, a rise of nearly 13 per cent in a year: Sustainable? Gujarat’s total debts are set to touch Rs 1.85 lakh crore by March-end 2014, highest ever. The latest “State Finances: A Study of Budgets of 2013-14”, released last month end, has said that the state’s total debts – which include internal debt taken from the market and other funding sources as also different types of liabilities – has said that the state’s total debts would rise by about Rs 21,000 crore in a year, from Rs 1.64 lakh crore last year as of March 2013. A rise of 12.87 per cent in a year, this is the highest increase in the debts in the last three years. Gujarat’ debts, which were Rs 1.43 lakh in March 2011, rose by 5.79 per cent to reach Rs 1.51 lakh crore in March 2012, and further to Rs 1.64 lakh crore in March 2013, a rise of 8.50 per cent. 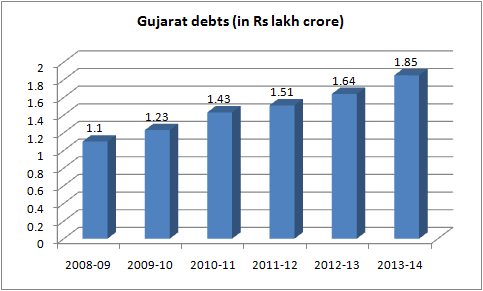 Debts have been a major reason for the Gujarat government to avoid budget deficit in the recent past. They go to fund nearly 20 per cent of the state’s budget. Significantly, if the RBI report is any indication, the state’s debts formed 24.6 per cent of the Gross State Domestic Product (GSDP) between 2010 and 2014, which is higher than the national average – 22.2 per cent. Debt-GSDP ratio signifies how deep a particular economy is in debt. Of the total Rs 1.85 lakh crore, Rs 1.45 lakh crore is internal debt. Of the 17 major states, which the RBI report identifies as being under the “non-specific category”, the states with a higher amount of total debts as of March 2014 than Gujarat are – Andhra Pradesh (Rs 1.94 lakh crore), Maharashtra (Rs 2.94 lakh crore), Uttar Pradesh (Rs 2.85 lakh crore), and West Bengal (Rs 2.45 lakh crore). The issue of debt sustainability of Gujarat has been a reason for major debate, especially among public figures. While politicians oppose to the BJP government in Gujarat argue that high debts are a reason of major concern, leading to great financial stress on the coffers, state officials say Gujarat’s debts are “perfectly sustainable”, as the state has paid all of them on dot. State officials believe that a high rate of growth of the state economy is one reason why the Gujarat government is able to withstand any debt trap, in which states like West Bengal have got into. Critics, however, say that the state has been able to sustain high debts mainly because it has not been spending “enough” on the social sector, particularly education. Thus, the Gujarat government’s projected expenditure on education in 2013-14 as percentage of total budgetary allocation is 13.9 per cent, which is one of the lowest in the country (click HERE to read). As many as 15 of the 17 major states spend a higher proportion on education. More, as for the social sector as a whole, the expenditure has got stagnated for the last several years.